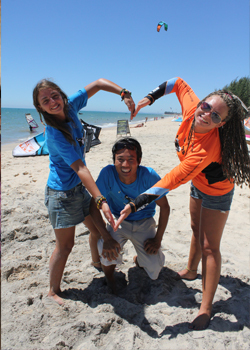 Join Vietnam Kiteboarding School’s amazing kitesurf family! An amazing kitesurf experience in Vietnam! You might be the backpacker that is just passing through or you are the experienced kitesurfer traveling the world with your kite to discover amazing new places, everyone at Vietnam Kiteboarding School is welcome to join our family. We love to here your stories and experiences and share our passion for water sports with you. For the people who are new to water sports we provide free introduction lessons to give them a taste of freedom that you experience when you get one with the wind and the water. We provide the more experienced rider with the best services and an deep interest in your personal water sports stories. Many of our visitors plan to stay for a few days and end up staying for weeks. Our staff will do everything in their power to make your stay a pleasant and memorable event. Our service goes beyond the provided lessons and helping launching and landing the kite, we like to show you our lifestyle with water sports during the day, amazing food in the evening and a crazy party in the night. 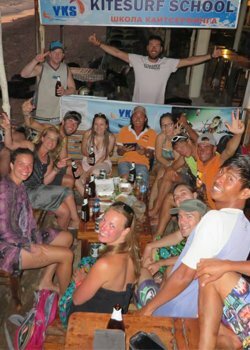 Here at Vietnam Kiteboarding School we are here to build new friendships and we hope you will soon join our family. A small history of Vietnam Kiteboarding School. Vietnam Kiteboarding School (VKS) was established in 2007 by Hai Tran. Mr. Hai was the first Vietnamese to become certified as an instructor by the International Kiteboarding Organization (IKO). Today it is one of the few original Vietnamese Kitesurfing Schools still active in Mui Ne Bay. Our instructors for kitesurfing, windsurfing, surfing and S.U.P. here at Vietnam Kiteboarding School have more then 10 years of experience with teaching. This makes us able to provide lessons for the beginner and the more experienced rider in any discipline. Use our air compressor to inflate your kite in seconds. When you need help setting up the kite, launching the kite in a safe way and land the kite when you finish your kiteboarding session our Beach Assistants are always there! Keep things simple and store your kitesurf gear at Vietnam Kiteboarding School. Vietnam Kiteboarding School got a great reputation with reliable staff and members. We like to keep it that way and don’t want to tempt anyone, so we have free private lockers available to keep your valuables safe while you enjoy your time on the water. We have a fresh water shower straight on the beach, so you can rinse your kitesurf equipment and refresh yourself after a good kitesurf session. Always good to have some privacy when you change into your swimming gear. Keep your friends up to date about your kitesurf adventures in Mui Ne! Enjoy a great meal after a long day on the water and loosen up your muscles on the dance floor of VKS’s own beach club!